Non stop rain through the night, coffee delivered to tent 5.30am, off shortly after in search of chimps. Vehicles slipping and sliding through black cotton soils to trail head. Chances apparently high as chimps spotted night before. Trail awash with water and mud clings generously to boots. Baboons tucking in to their morning breakfast at fig tree. Onwards and upwards steep climb to view point. Guides scan tree line and spot what looks like a chimp. Trek back towards river far in distance was what we had all come to see, a large chimpanzee. Descend, up, down, through heavily overgrown animal trails, grass over our heads, a few more sightings, none up close and personal. Back on main trail, humid, hot and heading home, suddenly chimps yelling alarm, close by? 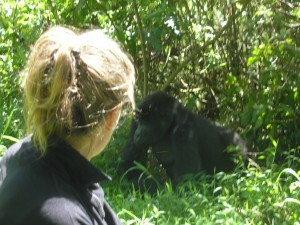 Ranger freezes and points; coming directly up trail towards us – large chimp, followed by 3 others. Just meters in front of us they swerve off trail and melt back into forest. Breathtaking. After leaving Semliki and a quick stop at Andrews Brothers in Fort Portal for road trip supplies we were off. Road is paved and our progress brilliant – the diversity of Uganda is astonding. In a few hours we have gone through Queen Elizabeth Park with it’s open plains (had to make a fast stop as two lions wandered across the highway right in front of our car). 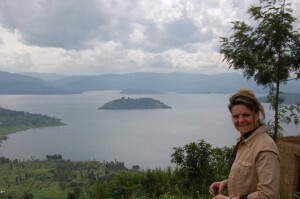 West snow-capped peaks of volcanoes, glaciers of the Rwenzoris – and east Lake George. We pass the Kazinga Chanel and turn towards the isolated Ishasha Sector, whose giant fig trees are home to famous tree climbing lions. 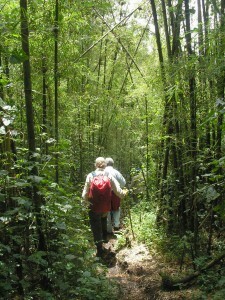 Finally descending to Lake Edward and our final destination – Bwindi Impenetrable Forest. Headed for luxurious Clouds Mountain Gorilla Lodge we hike in from Buhoma, a small town on the Congolese border on north end of Bwindi NP – the drive around otherwise is a bone-jarring 4 hours which drivers make with our luggage. Forest dripping with ferns, creepers and giant trees – primary forest in all it’s glory. Mist drifts in an out of valleys and sound of waterfalls all around. Arriving at river our next challenge – a vertigo-inspiring bridge (I use the word bridge lightly). We decide (to the horror of our National Parks Ranger), to take our chances and wade across barefoot. One more hour up – at trailhead a welcome sight – vehicles from Clouds with a cooler of drinks and cold towels. There is just enough light as we reach Lodge to take in distant volcanoes, rainforest and villages below – feeling like we have arrived at the top of the world. Clean up, drinks around roaring fireplace, volcanoes glowing in distance across border and drums beating in valley below. So many varied landscapes in just one day. Blissful early coffee in secluded cottage at Clouds Mountain Gorilla Lodge after cool night offset with crackling fire, warm duvets and steaming showers. Gorillas on agenda today. All precautions taken against nettles, mud, rain and steep terrain – look like overdressed fools heading up to Ranger Station two minutes from Lodge. Safety briefing and off we set – anticipation high. Down, down winding mountain paths, villages, bananas, beans, coffee, goats, chickens – children shouting hello. Final extreme descent over carpet of nettles, roots, long grass. Suddenly drop walking sticks, backpacks off – Ranger whispers gorillas closeby. Nervous, excited – out of undergrowth a young adult male approaches, sits down only metres away, tears of branches and begins to eat – we do not exist. Through thicket family of 19 approach – entire Nkuringo Family – including 3 Silverbacks and 11 month old twins riding on mother’s back. They surround us – eat, play, sleep – unconcerned. Permitted hour ends way too soon. Exhilarated! Gentle start to witness village life. School is in session – bright blue uniforms, smiles, 5 classrooms, 452 pupils – 6 to 14 years old. Local soccer field, highest point in village – only flat ground around! 360 degrees views. Women cultivating, clearing, terracing, planting…back breaking work. 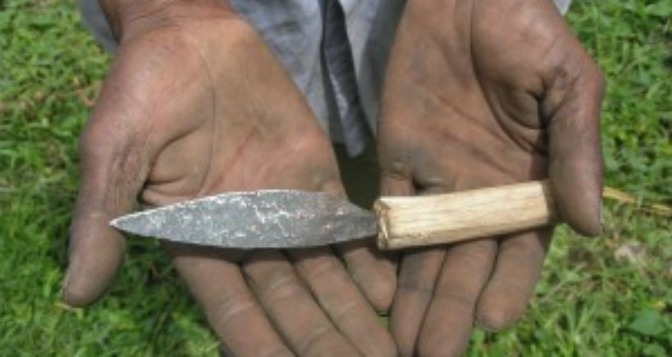 Move on to village blacksmith – bellows: a hollowed out forked log, covered with goat skin and worked by hand – Nicolas, master craftsman forges a knife with precision – 15minutes and $1 later- sale concluded. Meander down main track through village, ducks and ducklings for sale on grass verge, lodge sponsored community pig project prospering on lodge left overs – two have become eight. Uganda Rwanda border – Left our friends at Clouds, two hour bumpy bone jarring track to Kisoro – overnight in depressing dark, damp lodge, surroundings improved considerably with the amount of Chivas imbibed (no ice)! Up early to border crossing, picture tells the story, customs and immigration a breeze. 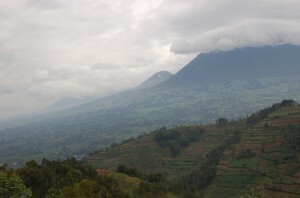 Into Rwanda and Volcanoes Virunga Lodge perched high above the lakes. Spent down day on deck overlooking lakes – three hour hike in afternoon through villages. Incredible population density – 480 people per sq km – every inch of land cultivated – houses on impossibly steep slopes – very little livestock – there is no room and seems impossible to sustain. Dinner with couple of Namibian guys just in from Bujumbura, Burundi – many stories. Nightcap listening to absolute silence as Rwanda sleeps – so many people all around and not a single sound – no cars, no music, no voices, no lights just the smell of wood smoke. 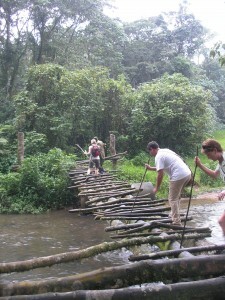 Left Virungas and lakes for gorilla tracking in Parc National des Volcans. John our Ugandan driver/guide leaves us to head back to Kampala. Our tracking companions include head of UNHCR for Africa – just back from Congo and two million refugees. Anni to UN guys who are wearing deck shoes “Is the UN always this prepared?” – irreverant? Drive up to the end of track and start making for park boundary fence – 74km of volcanic rock wall. Duck and dive through 30 foot high bamboo forest and foot long earthworms. An hour later, sticks down, packs off and there they are again…longer haired this time as we are over 3000m. Silverback Charles leads the family but Bunyenyeri the young black back steals the show – thumps his chest and leaps on back of tracker, while guides shout “NO PHOTO, NO PHOTO!” I almost pass out. Feisty he comes back for more but with gentle boot on bum finally moved off. Remaining time gives us a chance to watch sub adults play – our heart rates return to normal. On to new home Sabyinyo Silverback Lodge – 2558m above sea level – roaring fire in room, hot bath and magnificent views of volcanoes from verandah. Fabulous dinner with Manager and much discussion on Rwanda and gorillas … Ahhhhhhhh ! Emmanuel Bugingo from Gorilla Organization (GO) picked us up – visited GO projects around Ruhengeri – organic farms, water reservoirs, seed banks, adult literacy – mandate is to bring people out of forest to protect gorilla habitat. Onward towards Lake Kivu and north-western border of Rwanda and Democratic Republic of Congo, to another project; social integration of historically marginalized Batwa Pygmies. Two hours of rolling hills, pot holes, fields of potatoes and beans, bumping and squelching through mud, rivers of chasing children. 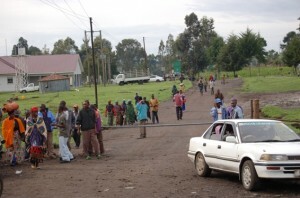 Batwa community lies 200m from the DRC at the foot of Mount Karasimbi – no fences, no border control – just more Africa! 82 people living in huts as they did in the forest – no shoes, hand forged tools – GO bought them land, taught them farming – Emmanuel mentors progress. Just finished first harvest of potatoes, maize being planted as we watched. Not one person in community has ever been to school – $800 earned from first harvest will enable kids to start school in January. Continued on to Gisenyi on Lake Kivu – interesting combination of wild frontier town and colonial getaway. Lovely late lunch on lake shore at Café Paradis Malahide – fresh tilapia done 10 different ways – yum! Overnight at brand new Gorillas Lake Kivu Hotel, tried to buy bathmat…doesn’t everyone want a bathmat embossed “Hotel Gorillas”? Viva FIFA! Breakfast with FIFA delegates at Hotel des Mille Collines – Hotel Rwanda. Walk from Embassy Row, industrial area, slums to Genocide Memorial. Visit humbling, haunting. Could not watch films, final room filled with photographs of children massacred. Walk back in rain, sky weeping? Afternoon spent in search of Kanga (traditional cloth). Food, plastic goods, electronics, streets divided by wares. Buses, taxis, motorbike taxis – everyone selling rides – why are the musungus walking? Finally street of cloth merchants, miles and miles of cloth; local, Congolese, Senegalese, top of the range Cote d’ Ivoire. Settle on one of each – spread the love. 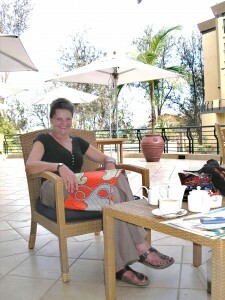 Retire to verandah of luxurious Serena Hotel; tea and apple pie. A day of juxtapositions. Give me a break – more musungus. Flew short 35 mins Kigali back to Kampala last night and early this am to Entebbe Pier for trip by boat across Lake Victoria to Ngamba Island. Chimpanzee sanctuary about 40 mins away on isolated, densely forested island, home to 44 animals – rescued from various places around the world – suitcases at airports, in national parks with snares around limbs, from poachers across Africa, orphaned when parents killed for bush-meat trade, zoos around the world and private nit wits. Arrive in time for 11 am feeding – screeching, howling cacophony as they come out of forest – right on time. 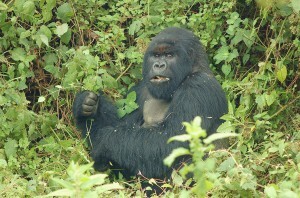 Much more aggressive than gorillas – greedily hoard as much of food and then lurk off to spots on edge of forest to eat. Just as quickly an hour later they disappear – they have run of whole island except small corner which is fenced off for keepers and visitors. 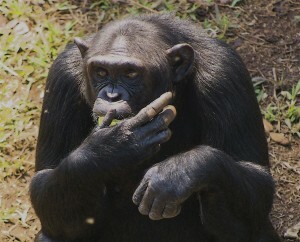 Chimps share 98% of our DNA – uncanny resemblance to behavior seen late at night where alcohol or ego are involved. Back to Kampala for last night in Africa. 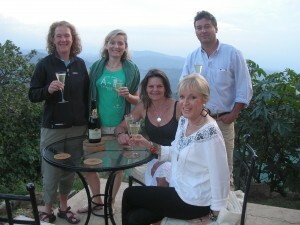 Thanks to The Uganda Safari Company and Wildplaces – Zara, Jonathan and everyone at Emin Pasha, Semliki Lodge, Clouds Mountain Gorilla Lodge – John Mugabwa from Volcanoes Safaris – Bernard de Wetter at Sabyinyo Silverback – Emmanuel Bugingo from Gorilla Organization for being inspirational – Paul Ntaganda from Hotel Mille Collines – Wafula from Gorillas Hotel Kigali – and many others along the way. And mostly to Africa for never letting up on overwhelming all senses. Fika Salama – travel well.